The first words spoken by an infant may seem to mark the beginning of the infant’s language development; however, by the time the first word has been spoken at about the age of 12 months, language development has been underway for more than a year. After birth, all normally developing children master the skills necessary for listening and speaking within a few years. Regardless of the language or languages spoken in the home, research has shown that language development proceeds in a remarkably similar fashion. In the 12 weeks before birth, sounds from the world outside of the womb can be heard. By the 24th week of pregnancy, the auditory system of the growing fetus is well developed. Expectant mothers may feel movement by the fetus in response to a loud noise. The startle response can be consistently observed by the 28th week of pregnancy. The early memories of speech sounds that are formed in the womb represent infants’ very first experiences with language. Research conducted with newborns has shown that newborns treat some sounds as familiar while treating other sounds as unfamiliar. Treating a sound as familiar suggests that the newborn gained familiarity with the sound before birth. For example, in research reported in 1980, DeCasper and Fifer showed that soon after birth, newborns prefer to hear the sound of the mother’s voice versus the sound of a stranger’s voice. Similar research reported in 1988 by Jacques Mehler and colleagues showed that newborns only 4 days old treated sounds from the mother’s language as familiar, whereas they treated sounds from another language that was not spoken in the home of the expectant mother as unfamiliar. In 1986, DeCasper and Spence reported one of the most compelling studies of this type. They instructed expectant mothers to read a particular Dr. Seuss book aloud during pregnancy. After birth, newborns showed a preference for hearing the familiar story over a different story that had not been read during pregnancy. A second group of newborns who had not heard either story before birth did not show a listening preference. At birth, all newborns demonstrate the remarkable ability to distinguish speech sounds occurring in all the world’s languages. This phenomenon has been referred to as categorical perception. The inborn ability to make fine-grained perceptual distinctions is not unique to humans. Chinchillas, which are small fur-bearing rodents, also demonstrate these perceptual abilities. Of course, chinchillas never acquire human language. An important difference between the perceptual abilities of children and other species is that the perceptual abilities of children change during the first year of life as a result of their listening experiences. By the end of the first year of life, children gradually lose the ability to distinguish speech sounds not occurring in the language or languages spoken in the home. Young infants’ ability to recognize syllables in speech has been shown to be influenced by the frequency with which they are experienced. Research conducted by Peter Jusczyk and colleagues showed that infants as young as 9 months could distinguish single syllables that were frequently experienced from those that were infrequently experienced. In contrast, infants who were 6 months old were unable to distinguish the two types of syllables. Furthermore, research conducted by Eleanor Saffran and colleagues has shown that infants who were 6 months old could distinguish two-syllable sequences, such as bida and kupa, when presented in a continuous stream of syllables, such as ibidakupadotigolabubidaku. In the study, some two-syllable sequences occurred frequently; others occurred infrequently. The results suggested that infants’ ability to recognize two-syllable sequences was influenced by the frequency with which the specific syllables occurred in the speech stream played for infants during the study. Research studies confirm what many new parents may have guessed—children may understand some language even before they have produced their first words. Research conducted by Roberta Golinkoff and Kathy Hirsch-Pasek and colleagues showed that young children who had only one to two words in their productive vocabulary demonstrated the ability to understand certain aspects of meaning contained in spoken sentences. In the study, children were seated in between two television monitors. The children sat comfortably on a caregiver’s lap and viewed two videos simultaneously. Both videos depicted the well-known Sesame Street characters Cookie Monster and Big Bird. In one video, Big Bird was carrying out an action and Cookie Monster was being acted upon. For example, Big Bird was feeding Cookie Monster or tickling Cookie Monster. In the other video, the roles were reversed. Cookie Monster was carrying out the action and Big Bird was being acted upon. As children viewed the videos, a spoken sentence was presented to the children, such as “Where is Big Bird feeding Cookie Monster?” The results showed that children preferred to look at the video that matched the meaning of the spoken sentence. This clever study showed that months before children are producing full sentences, they appreciate the fact that the one who performs an action, or the subject, is mentioned first in an English sentence, and the one who is affected by the action, or the object, is mentioned second. Infants’ first spoken utterances after birth are most certainly crying. Crying can be viewed as the first important form of communication. In the first 3 months following birth, infants develop distinct cries to indicate hunger, discomfort, or anger. By the third month, children have begun laughing and cooing. When infants coo, they produce elongated vowel sounds, such as oooh and aaaah. In the months that follow, infants’ productions become more and more complex. By the end of the first year of life, infants are generally producing their first words. 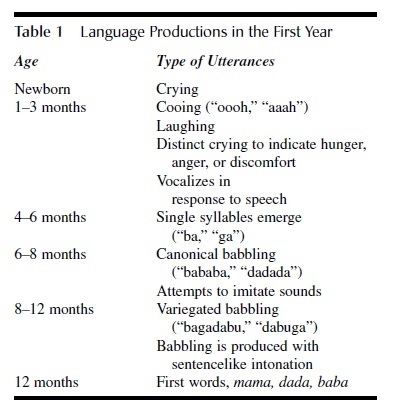 Table 1 summarizes the different types of vocalizations produced during the first year of life and the ages at which each type of vocalization is generally observed. By the sixth month, infants begin to practice the sounds of language. This stage of language development has been referred to as the babbling stage. Children begin babbling by repeating a single syllable, such as babababa or dududu. This type of babbling is called canonical babbling. Later on, children’s babbling becomes more complex, as they produce sequences that contain different syllables, such as bagada and dabuga. This type of babbling is called variegated babbling. Of the speech sounds that are produced during these babbling stages, the 12 most common speech sounds found in the world’s languages make up 95% of children’s babbled productions. Infants will babble speech sounds that do not occur in the language or languages that are spoken in the home. As the infant nears 1 year of age, the infant produces fewer and fewer speech sounds not represented in the language or languages of the home. It turns out that as children lose the ability to distinguish speech sounds that are not regularly experienced during listening, they are less and less likely to produce those speech sounds. Children’s first words may be mama or dada or the name of a favorite toy or pet. However, among a child’s first words may be invented words. Such words are used consistently by the child to refer to a specific object or action, but are not used by adults. These word inventions are called idiomorphs. For example, the child may consistently refer to a favorite food with an invented word, such as gump. In the book Mirror of Language: The Debate on Bilingualism, Kenji Hakuta describes a child who used the word Whew! as a greeting, when others might say hello. A possible explanation for the child’s choice of greeting was the fact that the child’s mother often said Whew! when first entering the child’s room in the morning, in response to an odor indicating that the child’s diaper needed changing. Children’s uses of idiomorphs are usually short-lived because they exchange their invented words for the words preferred by adults. Parents and caregivers may find it relatively easy to decipher the intended meaning of children’s production of words; however, there may be notable differences between children’s pronunciations and those preferred by adults. 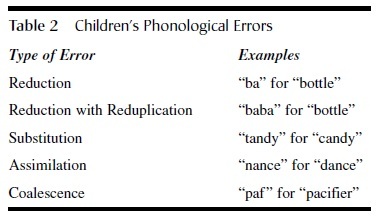 Table 2 displays five common phonological errors that children make when producing words. Reductions occur when children omit sounds from the target word. Reductions may occur with reduplication, as when children’s productions involve both a loss of sounds from the target word and a repetition of a syllable from the word. Substitutions occur when the infant replaces a phoneme with a different phoneme. Assimilations occur when the infant changes a speech sound in a word so that it is similar to a speech sound appearing later in the word. Coalescence errors occur when a word is shortened, by the loss of intermediate sounds. The quality of children’s productions improves over time; however, some sounds are mastered more quickly than others. For English-speaking children, it may take years to master the articulation of all the speech sounds. English-speaking children between the ages of 4 and 8 years may make errors in the articulation of a number of consonants. The initial consonants in the words red and long are typically mastered by the age of 5. The initial consonants in the words church, shirt, zoo, joke, van, and thumb are typically mastered by the age of 6. The initial consonant in the word them is typically mastered by the age of 7. The most difficult consonant in English is the intermediate consonant in the words treasure and measure; children typically master it by the age of 8. Although most children eventually achieve adult-like pronunciation on their own, some normally developing children may be referred to speech classes, sometimes called speech therapy. In speech therapy sessions, children receive directed instruction and practice for specific speech sounds. The typical adult speaker of American English may know more than 40,000 words. Considering the fact that the child produces the first word at the end of the first year, the task of building an adult-sized vocabulary is a daunting one. In order for children to achieve an adult-sized vocabulary by the age of 18, it is necessary to learn at least six words a day, on average. Parents and researchers have observed that the acquisition of vocabulary by young children does not occur at a steady rate. Between 18 and 24 months, children’s vocabularies may double or triple over a short period of time. This phenomenon has been called the word spurt. Researchers have discussed the possible explanations for the word spurt. One possibility is that children experience a naming insight, at which point they realize that everything has a name. Children then may set out to learn as many new words as possible. A second possibility is that there are internal changes occurring in children’s understanding of words. These internal changes may facilitate the learning of new words. For example, children may come to understand that objects in the world can be grouped into different categories, such as animals, vegetables, fruits, tools, and many others. Children may set out to learn additional members of a category after the category label has been learned. The earliest strategy used by children to learn words has been called referential learning. Children learn words that refer to concrete aspects of the environment. The vocabulary of the 18to 24-month-old contains far more nouns than other types of words, such as verbs and adjectives. One of the most effective strategies that children can use to learn new words involves asking an adult for help. Children may point to an object and ask, “What’s that?” This has been called the original word game. The adult provides the answer. The child may then attempt to say the word, and the adult provides a correction, if needed. Children employ other less obvious strategies when learning new words. When provided with a new word in response to the question—What’s that?, children as well as adults show a strong tendency to assume that the new word refers to the entire object, rather than to a part of the object or some other aspect of the object, such as color or texture. This strategy has been called the whole object bias. The philosopher Quine discussed this bias in his well-known Gavagai Problem. The problem was formulated as a hypothetical case. Imagine you are in a country where you do not speak the language and no one in this country speaks your language. You are walking along with a person native to this country. A rabbit darts across the path, and your companion points toward the rabbit and utters, “Gavagai.” What do you assume Gavagai means? Usually, gavagai is taken to mean rabbit, rather than other comparably plausible meanings, such as hopping, fur, ears, or white. Children approach word learning with two additional biases. These are the taxonomic bias and mutual exclusivity assumption. The taxonomic bias refers to the fact that children generally assume that a new word refers to a type of object, rather than a specific object. For example, the child will assume that the word dog refers to a group of animals, not just Toto. The mutual exclusivity assumption refers to the fact that once an object has been associated with a particular label, it will not be assigned a second label. This assumption leads to useful inferences about unknown objects. Consider the case in which a child is shown two objects. Assume that the child has already learned the label of one of the objects and knows it to be a wrench. If the child is then told Hand me the hammer, the child will infer that hammer refers to the object that is not the wrench because a wrench cannot be both a wrench and a hammer. As any parent can attest, children’s usages of newly learned words may not always conform to the usages preferred by adults. A child may use a word, such as cow, to refer to cows as well as other types of animals, such as any four-legged animal. Such errors have been called overextensions. Other examples of overextensions include using the word, such as hot, to refer to any object that is forbidden or using the word, such as hat, to refer to any object placed on the head. When children produce overextensions, they use a word to refer to a set of objects that is larger than the set referred to by adults. In contrast, underextensions occur when children use a word to refer to a set of objects that is smaller than the set referred to by adults. For example, a child may use the word shoes to refer to a single pair of shoes, such as Mommy’s shoes, rather than any and all pairs of shoes. Other examples of underextensions include when children use the word lights only to refer to the headlights on a car, rather than all types of light, and when children use the word milk to refer only to milk in a glass, rather than milk in any container. 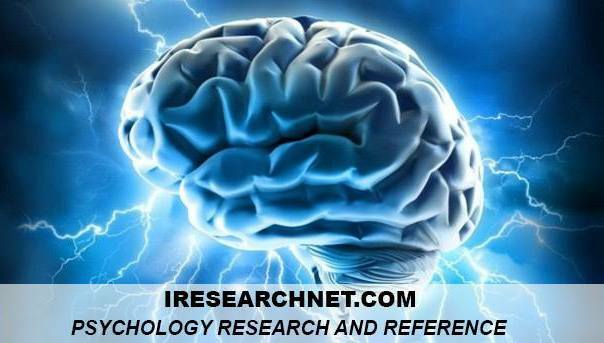 Children’s single-word utterances may be produced with sentence-level intent. The term holophrase refers to children’s single-word utterances that have meaning more complex than that of a single word. For example, the utterance Daddy may mean a variety of things. Daddy may name the presence of the person daddy. Daddy may be a request for Daddy to perform some action. Daddy may be a reference to a location, if Daddy were holding a desired object. Daddy may also refer to some meaning comparable to the meaning of an adult sentence, such as I want Daddy to come here. By 24 months, children are regularly producing two-word utterances, such as Daddy go or eat cookie. (See Table 3.) These two-word utterances can be viewed as miniature sentences. 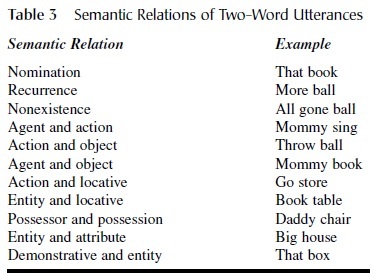 Roger Brown showed that there are 11 types of semantic relations typically occurring in children’s two-word utterances. Approximately 75% of English-speaking children’s two-word utterances can be classified in these 11 categories. Research conducted by Dan Slobin has shown that these semantic relations also appear in other languages, including Samoan, Finnish, and Russian. Between 24 and 36 months, children’s utterances become more and more similar to the sentences produced by adults. During this time, children are producing longer utterances, on average, such as utterances that contain a subject, a verb, and an object. Furthermore, children begin producing words that contain grammatical word endings or morphemes, such as the suffix -ed, which is used to create the past tense form of verbs, as in walked and talked, and the suffix -s, which is used to create the plural form of nouns, as in cups and dolls. Classic research conducted by Jean Berko-Gleason showed that children learn to form new words, such as past tense verb forms and plural nouns, by learning rules. BerkoGleason devised the Wug test to demonstrate children’s knowledge of word formation rules. In the task, a child is presented with a picture of an unusual bird-like creature. The child is told, “This is wug.” There is an accompanying picture depicting two of the odd creatures. The child is told, “Now, there are two of them. There are two. . . .” Children are asked which word comes next. Children as young as 3 can provide the plural form of wugs, a specific word form that they could not have heard before because the word singular word wug was a word created for use in the study. Berko-Gleason also tested children’s ability to use the English rule for using the past tense suffix -ed. Children saw a picture of a man holding a large unusual object in his hands and moving the object from side to side. Children were told, “This man is ricking. Yesterday, he. . . .” Again, children as young as 3 can fill in the past tense form, which they could not have heard before. The learning of word formation rules may lead children to produce forms of words that adults would not produce. In English, there are some plural nouns and some verbs that are not formed by adding the suffixes -s or –ed. For example, the plural of the noun foot is feet, rather than ∗foots. The past tense form of the verb eat is ate, rather than ∗eated. When children discover the rule for forming plural nouns from singular nouns or the rule for forming past tense verbs from verb stems, they may sometimes apply the rule inappropriately, as when they say foots instead of feet or eated instead of ate. These errors are called over-regularization errors. It is typical for children to produce an over-regularized form of a word that was used correctly before the rule was learned. For example, many young children produce the correct forms of the verbs go, went, gone in the first 24 months. Later, when the rule for forming past tenses is learned, children may produce errors, such as ∗goed or ∗wented. After rule learning occurs, children must then determine which words follow the rule (or are regular forms) and which words do not follow the rule (or are irregular forms). Children’s productions of over-regularization errors become more and more infrequent in the year following the learning of particular word formation rule. Children’s mastery of complex sentence forms suggests that children master sentence production in a series of stages. Children initially appreciate what a particular type of word means, but then must figure out how to use the word appropriately in a complete sentence. Research conducted by Edward Klima and Ursula Bellugi suggests that children’s use of wh–questions, such as what did you eat?, is mastered in a series of stages. The first stage occurs in the first half of the third year of life. During this time, children produce questions with the wh– word located at the beginning of the question, but the subject and the verb are ordered as they are in an affirmative sentence, as in Where I should put it? In the second stage, children appropriately order the subject and the verb in affirmative questions, as in Where should I put it? However, children do not use the appropriate subject-verb order for negative questions, as in Why you can’t sit down? In the third and final stage, children produce questions with appropriate subject-verb order for negative as well as affirmative questions. Children are typically between 48 and 54 months when they are producing well-formed wh– questions. Edward Klima and Ursula Bellugi’s research also suggests that children’s production of negative sentences progresses in a series of stages, progressing from an initial stage at which the meaning of a negative word, such as no, is learned to a final stage at which children are positioning a negative word or morpheme appropriately within a sentence. Young children’s first negative sentences have the form No eat cookie. The negative word no is placed at the beginning of a sentence. In the second stage, the negative word is produced in the middle of the sentence immediately before the verb, as in Doggie no bite. In the third and final stage, the child uses the negative word contracted with the verb in a form that adults use, as in Doggie doesn’t bite. Many children are born each year with some form of hearing impairment. About 1 in 1,000 children is born with a severe hearing loss. In the first months of life, the vocalizations of deaf infants and hearing infants may not be easily distinguished. Deaf infants will cry, coo, and begin to babble. The amount of babbling and the quality of the babbling produced by deaf infants may be reduced when compared with the babbling of hearing infants. Deaf infants are unlikely to produce repeated consonant-vowel syllables characteristic of the canonical babbling stage. Deaf infants who are exposed to sign language from birth develop sign language skills in a series of stages similar to those observed when hearing infants develop spoken language skills. Signed languages such as American Sign Language (ASL), British Sign Language (BSL), and Chinese Sign Language (CSL) are unique languages, each having their own rules of grammatical structure. Deaf infants exposed to a signed language will spontaneously produce gestures that can best be described as manual babbling. They will later produce one-sign utterances and later multi-sign combinations. Just as with hearing children, as deaf children mature, their multi-sign combinations become more and more complex in terms of the grammatical properties of the sign sequences. Signing children also make errors in sign production that are similar to the spoken errors made by speaking children. Signing children may produce idiomorph signs, sign overextensions, sign underextensions, and sign over-regularizations. Children’s signed sentences also become more and more complex over time. In summary, regardless of language type, the development of language proceeds in a remarkably similar fashion. An age-old question in the study of human behavior is the classic nature versus nurture debate. How much of children’s ability to acquire language is the result of nature, or innate knowledge, and how much is the result of nurture, or general learning influenced by what is occurring in the environment. A number of prominent language researchers have argued that the relative speed and ease with which all normally developing children acquire language is best accounted for by assuming that certain aspects of language knowledge are innate—the child is born “hard-wired” for language. The most notable of these researchers is Noam Chomsky, who argued that all children are born with a language acquisition device (LAD) containing knowledge of the essential properties of all human languages. Opponents of this view argue that language learning can be explained as any other type of learning can be explained. Children’s exposure to language and experiences with language can account for the language learning that takes place. Although the nature versus nurture debate in the study of language development is unlikely to be settled in the near future, there is mounting evidence that biology plays an important role. Since the publication of Eric Lenneberg’s book Biological Foundations of Language in 1967, researchers have recognized the possibility that there may be a critical period for learning language. The critical period for learning language is generally thought to be from birth to puberty. Some researchers, including Steven Pinker, have suggested that the critical window for language learning is from birth to the age of 5. After the critical period has passed, learning language is more difficult and less successful. Individuals who do not receive adequate exposure either to spoken or signed languages during the critical period may find it impossible to achieve native-like proficiency. The most compelling evidence for the view that biology plays a key role in certain aspects of language development comes from studies showing the existence of inheritable language disorders. The term specific language impairment (SLI) has been used to describe cases in which children show difficulty processing language, whereas they perform normally on tests of general cognition. Research suggests that SLI affects about 3% of the population. Researchers have shown that the incidence of SLI is much higher among family members of an individual identified as having SLI than the incidence in the general population. A family case study reported by Myrna Gopnik and Martha Crago in 1991 showed that of 30 members in an extended family, 16, or 53%, were identified as having SLI. The pattern of inheritance observed in this family suggested that a single dominant gene may be responsible for the disorder. All normal developing children who receive adequate exposure to human language will learn language within the first few years of life. By the end of the first year, children are producing their first words and understanding much of the language spoken around them. By the end of the second year, children have amassed a vocabulary of several hundred words. By the end of the third year, children’s utterances are becoming more and more similar to the sentences of adults. Berko-Gleason, (1997). The development of language (4th ed.). Boston: Allyn & Bacon. Eisenson, (1997). Is my child’s speech normal? (2nd ed. ).Austin, TX: Pro-Ed. Gopnik, , & Crago, M. (1991). Familial aggression of a developmental language disorder. Cognition, 39, 139–141. Hakuta, (1986). The mirror of language: The debate on bilingualism. New York: Basic Books. Hamaguchi, P. (1995). Childhood speech, language, & listening problems: What every parent should know. New York: Wiley. Lenneberg, (1967). Biological foundations of language.New York: Wiley. Pinker, (1993). The language instinct. New York: Penguin.